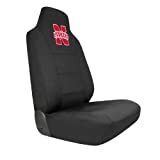 Pilot Automotive’s Collegiate Seat Covers add a unique look to your vehicle. Officially licensed, these high back seat covers capture the excitement of your favorite team with an embroidered logo. The breathable neoprene material offers a comfortable feel and keeps fresh in most temperatures. Universal fit and easy installation for your truck or car.